Is your resume as thorough as the mortgage documents you review? View this sample for a mortgage closer to see how you can get your resume in shape. Thorough and error-free documentation is paramount when moving a mortgage to closing. During a job search, your resume is the most important document to get in order, says resume expert Kim Isaacs. 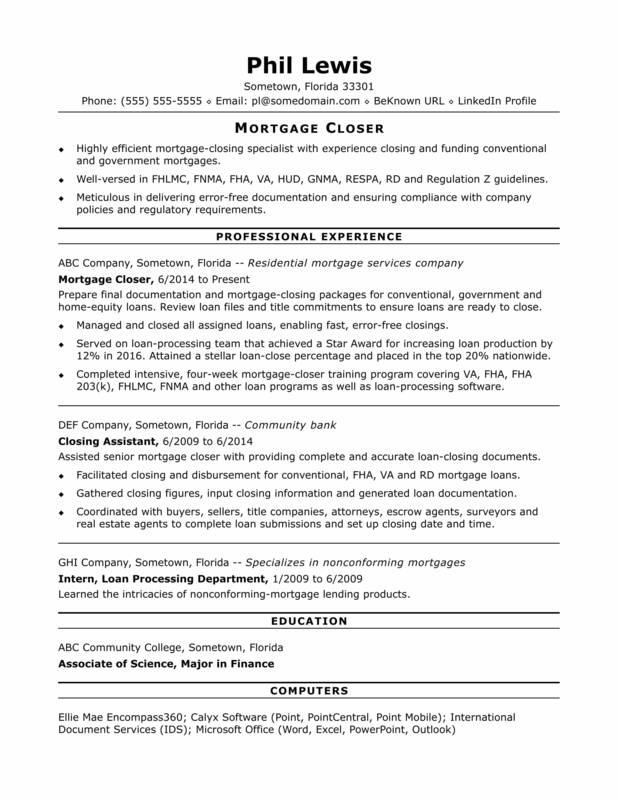 View the sample resume Isaacs created below and download the mortgage closer resume template in Word. And if you need more help, let the experts at Monster's Resume Writing Service create a high-impact resume for you that will impress employers. Additionally, you can learn about real estate careers and search for mortgage closer jobs on Monster. Highly efficient mortgage-closing specialist offering three years of experience closing and funding conventional and government mortgages. Well-versed in FHLMC, FNMA, FHA, VA, HUD, GNMA, RESPA, RD and Regulation Z guidelines. Meticulous in delivering error-free documentation and ensuring compliance with company policies and regulatory requirements. Prepare final documentation and mortgage-closing packages for conventional, government and home-equity loans. Review loan files and title commitments to ensure loans are ready to close. Managed and closed all assigned loans, enabling fast closings that were free from errors and issues. Served on loan-processing team that achieved a Star Award for increasing loan production by 12% in 2011. Attained a stellar loan-close percentage and placed in the top 20% nationwide. Assisted senior mortgage closer with providing complete and accurate loan-closing documents. Facilitated closing and disbursement for conventional, FHA, VA and RD mortgage loans. Gathered closing figures, input closing information and generated loan documentation. Coordinated with buyers, sellers, title companies, attorneys, escrow agents, surveyors and real estate agents to complete loan submissions and set up closing date and time. Learned the intricacies of nonconforming-mortgage lending products.